Hi! I’m Ellie from MOSHI MOSHI BOX Tourist Information Centre. 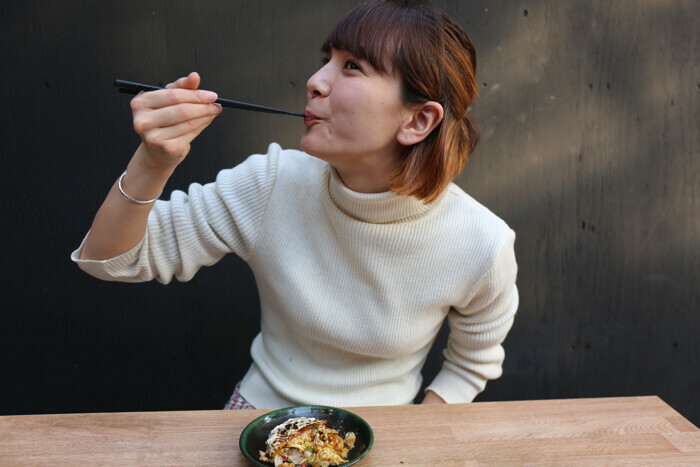 At MOSHI MOSHI BOX, we get a lot of people asking us to recommend a place where they can eat authentic Japanese food in Harajuku. That’s why I’ve decided to take a trip to “Sakura Tei”. 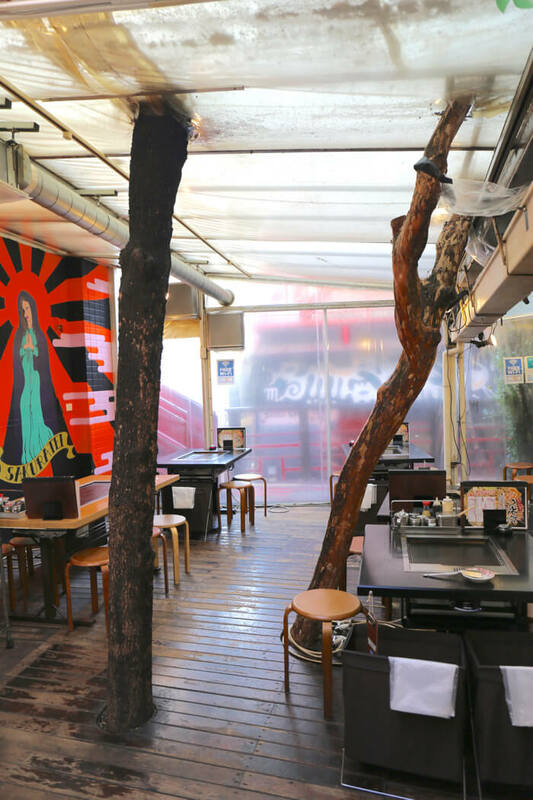 Sakura Tei is a restaurant not far from MOSHI MOSI BOX that serves a typical Japanese dish – onokomiyaki. Half of Sakura Tei’s customers are tourists from outside of Japan, so I would really recommend this place to foreigners. 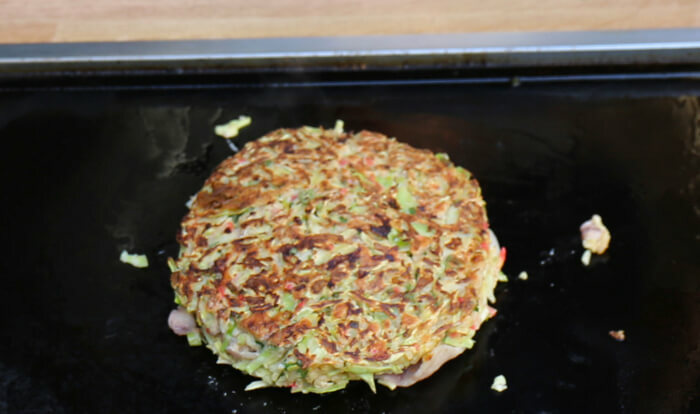 What exactly is okonomiyaki? Its basic form is a savoury pancake made from water, wheat flour, shredded cabbage and fried batter pieces. 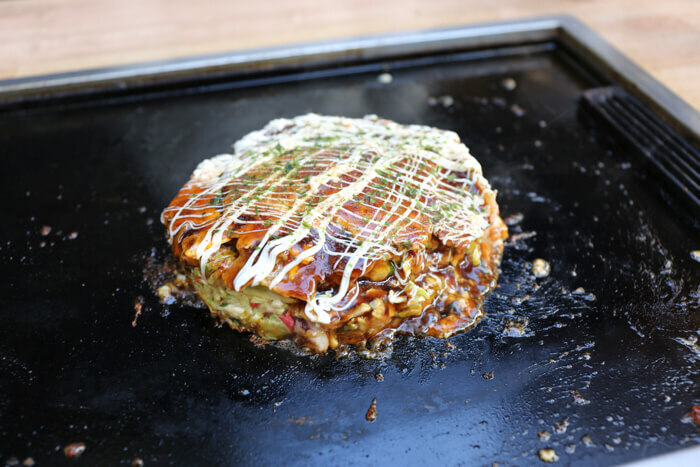 The name okonomiyaki means grilled (yaki) as you like it (onkonomi). Therefore, it can be customised with seafood or meat. The ingredients are mixed together and then grilled in a cast iron pan. This is one of the most popular dishes in Japan. Walk down Meiji-dori in the direction of Murasaki Sports (ムラサキスポーツ) . Meiji-dori is the street on which MOSHI MOSHI BOX is also located. Once you are at Murasaki Sports, walk down the street between Murasaki Sports and New Balance (NB) and then turn left at the Family Mart. You will immediately notice that the road splits off into two directions. From this point, take the thin pathway on your left. 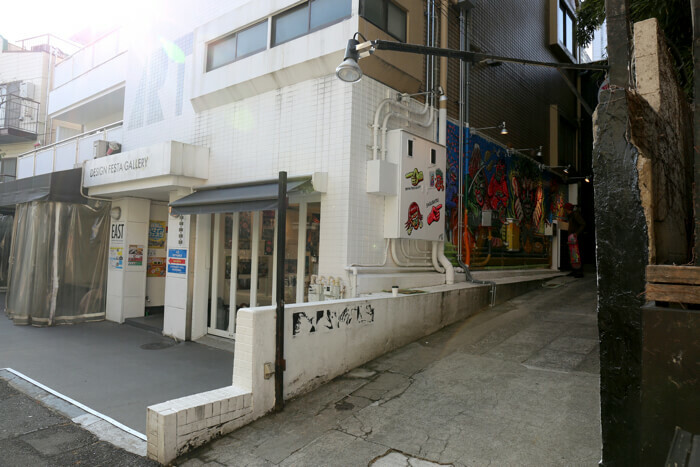 You will see a white building on your left called “DESIGN FESTA GALLERY”. The restaurant Sakura Tei is on the left of this building. 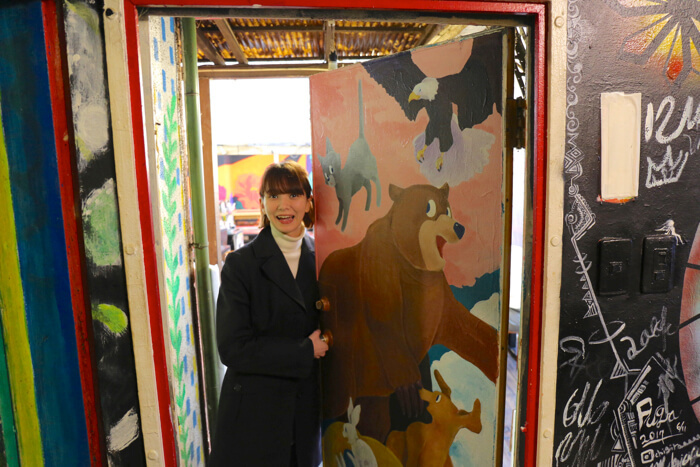 Look out for the vivid wall art and bamboo exterior – this is a sign you are in the right place. If you get lost and don’t know the way, don’t hesitate to ask us for help at MOSHI MOSHI BOX. The interior is also photogenic! 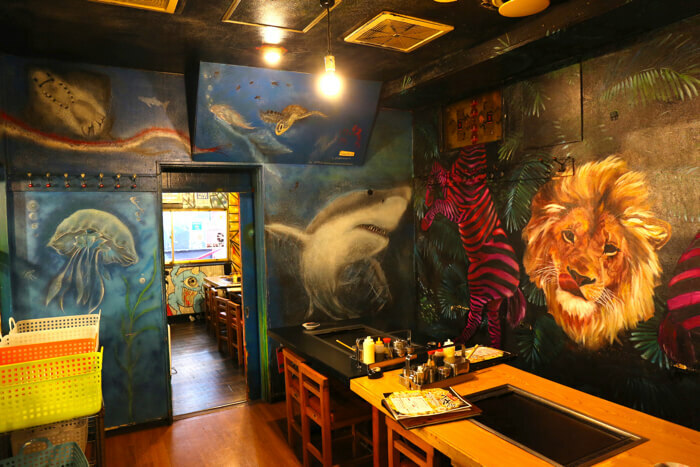 Each wall is painted with beautiful artwork. A new design is painted on the walls every half year, so you might see something different if you come back later in the year! 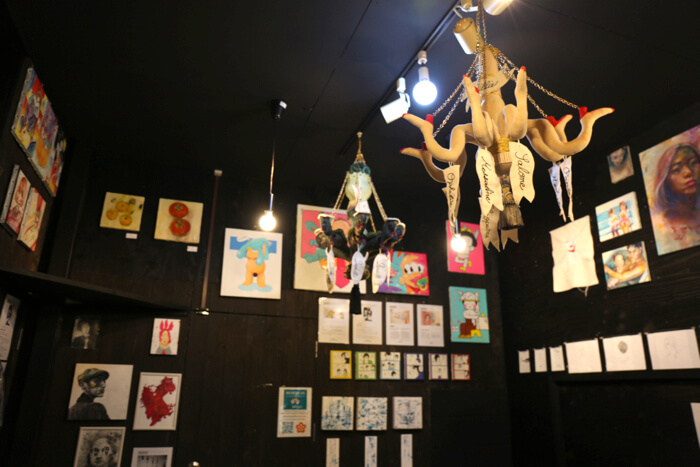 Some paintings were offered by a solo exhibition artist from the “DESIGN FESTA GALLERY” next door. Other designs were even painted by the restaurant staff! The restaurant seats more than 200 people, making it perfect for even large parties. Being hit by a wave of beauty, it was fun to take pictures of the interior even before having entered. What caught my attention the most were the trees that are growing inside the restaurant. I was told that they were growing here before this place became a restaurant, and rather than cutting them down, the owner nurtured them, incorporating them into part of the restaurant. From this dynamic and unique idea, an atmosphere of freedom formed. You wouldn’t even believe you are still in Harajuku. The atmosphere is so relaxing. Order an original Okonomiyaki at Sakura Tei! 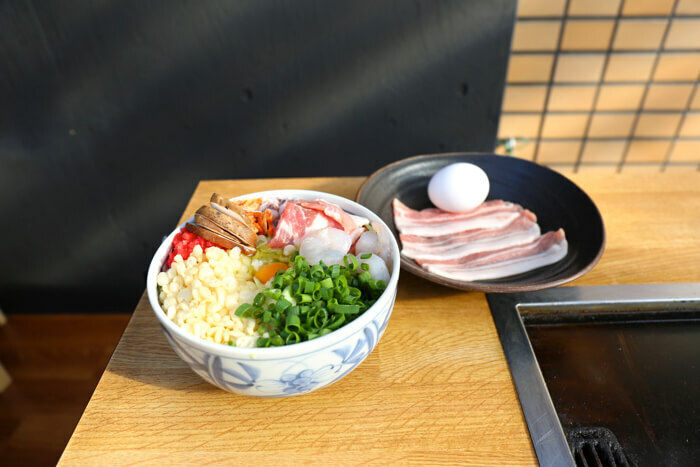 Besides okonomiyaki, the menu includes an abundant range of dishes such as monjayaki (similar to okonomiyaki), yakisoba (fried noodle dish) gyoza (dumplings) and teppanyaki (grilled food served on an iron plate). 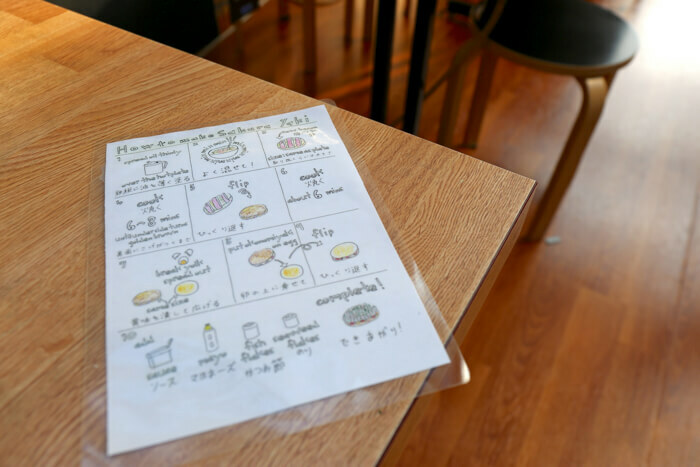 There is also an English menu available and many foreigners belong to the team of staff. They can speak many languages including English and Korean. You can order vegetarian, vegan and halal food too so if you have any questions, feel free to talk to the staff! I ordered Sakura Tei’s most popular item off the menu – the “Sakura yaki” (￥1,400). All the prices on the menu are the prices including tax. Pork, squid, shrimp, matsutake mushrooms, welsh onions, pork belly slices and egg are the eight ingredients mixed into the batter of this okonomiyaki. 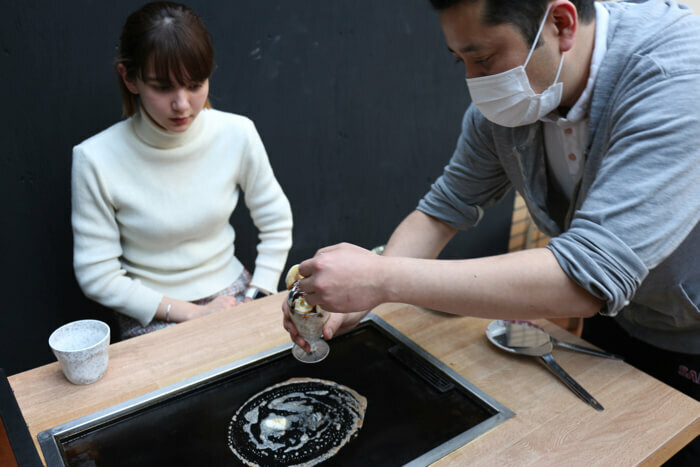 Each table has a hot teppanyaki plate fitted into it so you can make your own okonomiyaki yourself. It’s ok even if you’ve never made one before! Easy instructions on how to make it are provided on each table. I drew up all my courage and went for it!! I did it! Whenever customers flip their okonomiyaki particularly well, there is always a mini celebration. 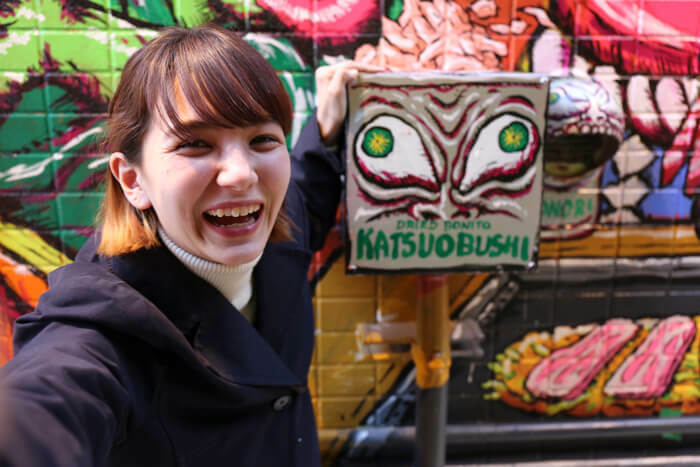 It’s all about celebrating the process of making okonomiyaki and having fun here. 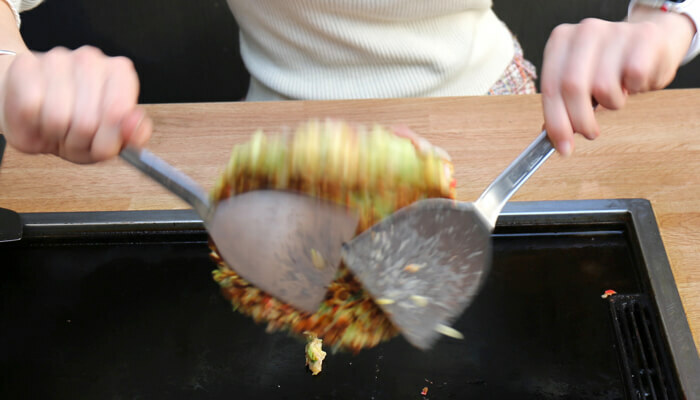 A staff member even mentioned: “I love seeing the customers having fun while making okonomiyaki”. After flipping, cook for another 6 minutes. When your okonomiyaki is cooked, place your egg on top (that you lightly cooked on the teppanyaki grill) and then add the original sauce and mayonnaise. Sprinkle on some katsuobushi (dried skipjack tuna flakes), some more mayonnaise and you are done! I immediately took my first bite while it was still piping hot. 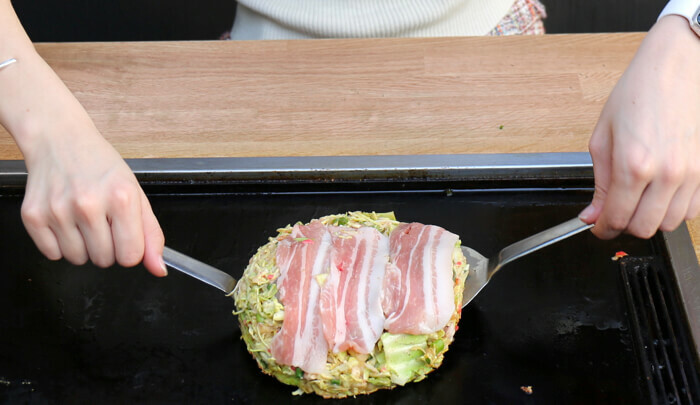 Normally, okonomiyaki is slightly thinner than this one…but what about the flavour..? 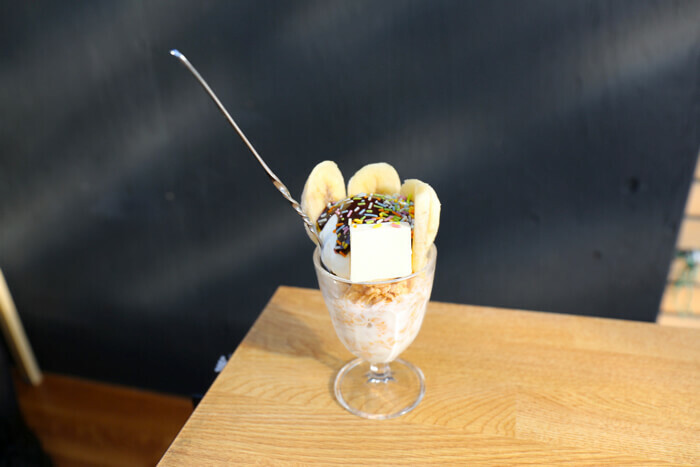 After having okonomiyaki, you always want something sweet in your mouth! Skimming the menu, the one thing that caught my eye was the “ama-imonja yaki banayan” (￥550). Monjayaki uses wheat flour that is lightly mixed with water amongst a range of ingredients and then fried on the pan. It resembles okonomiyaki but is thicker. I quickly gobbled up the ama-imonja yaki. It was easy to make! Just mix all the parfait ingredients together and then cook it. Just looking at this dessert made feel like an excited child. I had never tasted anything like this before! It tasted a bit like a banana muffin and the caramelised golden-brown areas were sweet – I just couldn’t stop! You should try making this one too! There is one more thing I would like to recommend you to have after your meal. 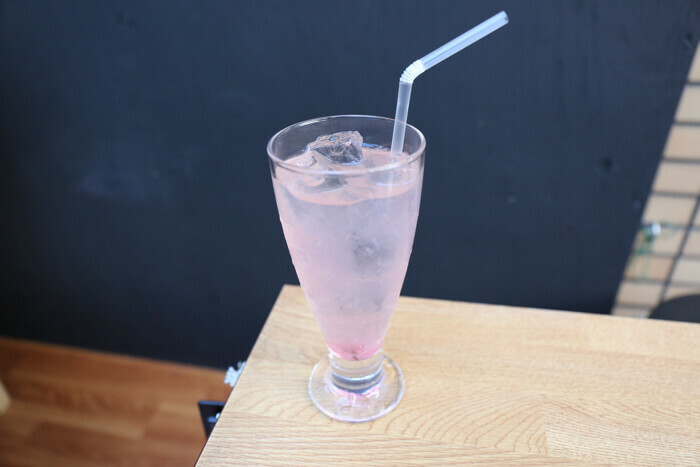 The homemade “Sakura Lemonade” (￥500 ). Their lemonade includes a Sakura-salted flavor that is popular among foreigners. The fresh flavor and taste of sakura brings back memories of spring. You can enjoy this drink at any time of year, so please check it out! That was my first visit to Sakura Tei. It wasn’t just the okonomiyaki, dessert and drink that I enjoyed, but also the way the restaurant makes the customers laugh and smile. 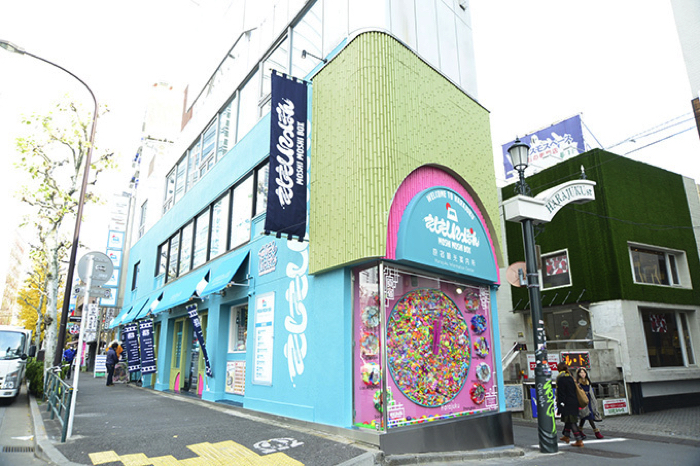 If you’re ever in Harajuku, make sure to check this place out!